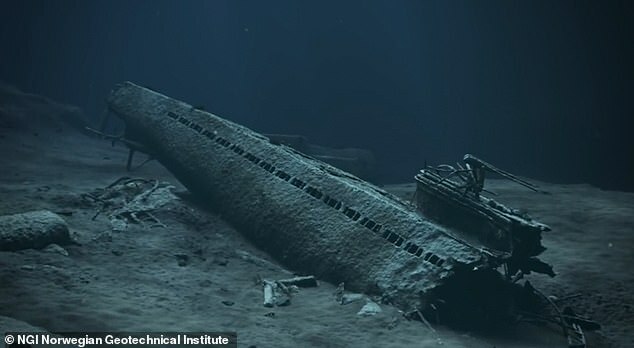 A Nazi submarine described as an 'underwater Chernobyl' is being sunk into sand to stop deadly chemicals leaking into the sea and the surrounding bed. The wreckage of the German U-boat was left with 1,800 canisters of toxic mercury seeping into the sea off Bergen in Norway. U-864 was torpedoed by a British submarine in early 1945 as it headed for Japan carrying jet parts. The vessel left Kiel in Germany on December 5, 1944, but the hull was damaged in an attack and the captain headed for Norway to carry out repairs. Since the battle the U-boat has stayed 500ft below the surface, split into two parts, around two miles from Fedje, an island of 600 people, leaking dangerous mercury into the sea from the rusted containers. Around 8lb (4kg) a year has oozed into the water of the Norwegian Sea causing boating and fishing in the area to be banned due to the toxicity coming from the wreck. The leak caused high levels of contamination in of cod, torsk and edible crab around the 2,400-tonne wreck. As a result the Norwegian government is to seal off around 11 acres of the seabed under up to 40ft of rubble to stem the leakage from the cargo on board. A specially-built rig was made by Dutch contractors to dig around the boat and without damaging the hull any further and contaminating the sediment in the seabed.